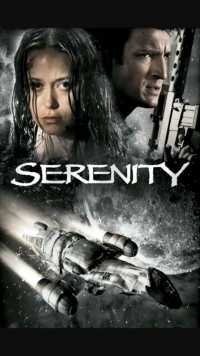 Serenity is a 2005 American science fiction action film written and directed by Joss Whedon. It is a continuation of Whedon’s short-lived 2002 Fox television series Firefly and stars the same cast, taking place after the events of the final episode. Set in 2517, Serenity is the story of the captain and crew of Serenity, a “Firefly-class” spaceship. The captain and first mate are veterans of the Unification War, having fought on the losing Independent side against the Alliance. Their lives of smuggling and cargo-running are interrupted by a psychic passenger who harbors a dangerous secret. The film stars Nathan Fillion, Alan Tudyk, Adam Baldwin, Summer Glau and Chiwetel Ejiofor. It was released in North America on September 30, 2005 by Universal Pictures to generally positive reviews and several accolades, including the Hugo Award for Best Dramatic Presentation, the Prometheus Special Award and the Nebula Award for Best Script, but underperformed at the box office.